Sorry about that! I was messing around with some back end database stuff and made a silly change without realizing that was causing wordpress to be unable to connect to the database. All fixed now! I know it’s been a while since any updates, but I am still around and looking after the site. I have been updating the Tabletop Geeks Facebook page slightly more (still getting tons of tabletop games and playing them!). Also, as a quick follow up to the last news post: Hex: Shards of Fate has recently released their large PvE update which now turns the game into an RPG TCG! There’s a whole campaign map, an RPG character/leveling system, and a TON of cards and equipment to collect! It’s incredibly fun, and I highly recommend checking it out. I probably should have posted this sooner but there have been several Malifaux updates recently. 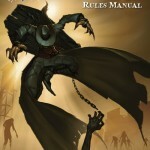 First of all, for those who might not have heard the Malifaux Rules Manual and Malifaux Gaining Ground (Tournament) files have been posted up. These are available on Wyrd’s website and are also linked in our Malifaux Downloads page. These are both available as completely free pdf documents. The Rules Manual includes updated rules with better examples that should help clarify things a bit more. The Gaining Ground document offers up full rules and information on running a Malifaux tournament. Powered by WordPress v 5.1.1. Page in 0.990 seconds.